For the first time in a few months there has been some meaningful movement in this graph. The use of OS 7 is up to 13.9% while use of OS 6 has also improved after being flat since last October. The percentage of users on OS 5.0 or higher has increased by more then two percent and is now up to 94.5% of all devices. Last January only 79.6% of users were running an OS at 5.0 or higher. With the percentage of active users on 4.x dwindling the recent update to the Binary Clock app only supported OS 5.0 and higher, and many other apps will probably be taking that approach in the near future as well. This data was taken from downloads of the popular BlackBerry strategy game Pixelated. 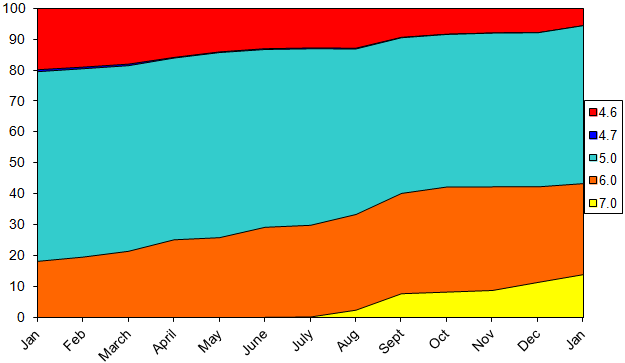 Data shown on the chart is from the beginning of January 2011 through the end of January 2012.